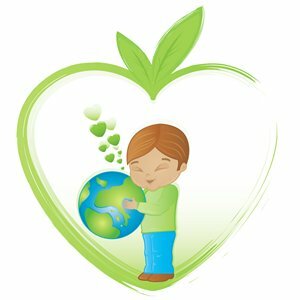 Happy Earth Day from Eve! It just so happened that I was able to ride my bike in to work this most beautiful morning. Unfortunately, I can’t do this everyday and realize that in order to sustain our planet, we need to make an effort on more than just one day per year. I am not here to argue if global warming is real or not, which, to me, the “label” doesn’t matter. I feel politicos and talking heads get too caught up in the details and definitions, what matters is that we use our common sense and conscience in making choices to maintain our planet. And, I don’t think we have to be extreme in our actions, although that would certainly speed things up, but I know how change and people work together, so let’s start small. I believe that small changes by a majority of people can make a significant impact on the place we call home, Earth. The space program has been put on hold, so it’s not looking good that we could move to the moon if we continue to destroy this home, so we need to focus on the actions that can uphold this abode for future generations. Now, since I am a dietitian and avid runner, I will focus on our food purchases and fitness. Activity is much easier to address, so I’ll start there first. Ride your bike to work like I did today, it was a beautiful way to get to work, definitely less stressful than driving and I was able to get in some activity. I know others that have skateboarded to work and maybe even some roller girls that have strapped on those skates to get form place to place. Instead of driving from parking lot to parking lot, park centrally and walk to the usually very close stores. Walking, biking, and skating to places accomplishes much more than just sparing the world from more carbon emissions; it is also kind to the pocket book, can reduce stress, and increase activity. So, it’s a win, win, win, win!!!! On to the food…most would probably think that I would talk about organic here and focus on that aspect, which is certainly much more sustaining to our soil and doesn’t pollute our waters or food, which is a definite plus. 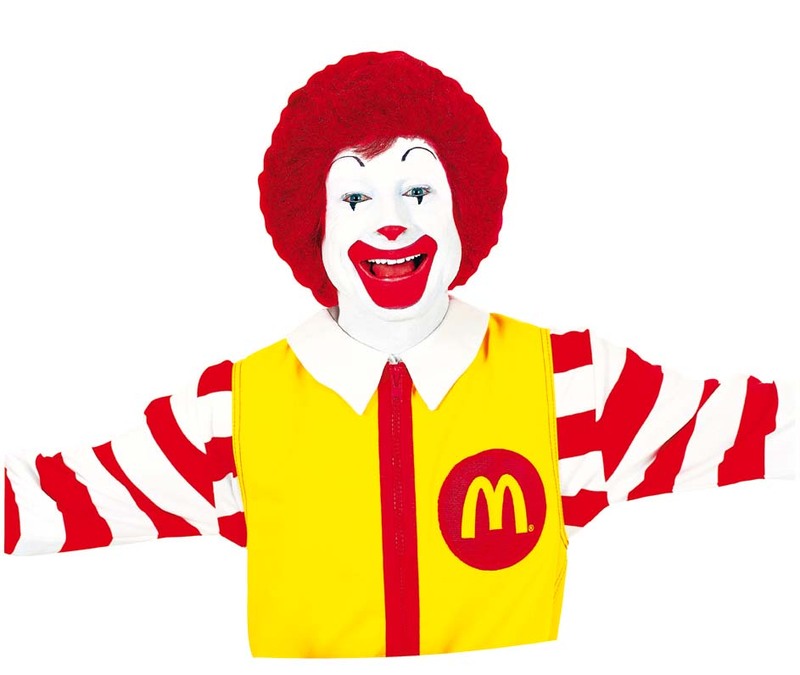 But, unfortunately, even with organic foods from South America, Hawaii, Florida, and California, they have to get to us through the use of fuel and they are usually packaged in lots of plastic and other goods that will likely not get recycled. I am not saying that you should go to the extreme of a locavore, someone that only eats within a 100 miles radius of their home, but when you can, buy local. It would be pretty difficult to be a locavore here in Indiana, I am sure some have done it, but I would certainly miss avocados, bananas, almonds, and mangoes…mmmm….well, I suppose I could move to Chile or Brazil. Short of moving across the world, small changes like substituting some local foods into your diet can make a difference. You are supporting your local economy and the small farmer, giving them income to continue doing what they’re doing. Also, by buying local, you are more than likely getting organic, getting fresher foods as they haven’t traveled days or weeks, reducing the use of fuels to get these foods to you, and eliminating the excessive packaging. Most have the “all or nothing” mindset, but I do believe that small changes in your purchasing decisions can make a big impact! There are so many ways to get local foods here in Indiana. I have links to the right with local farms that have a CSA (Community Supported Agriculture) for vegetables, chickens, and eggs, all of which I belong to. 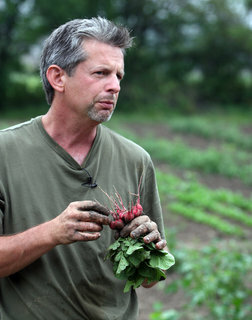 The guy in the picture is Todd Jameson, he is the owner, along with his wife, of Balanced Harvest Farms, which is where my husband and I get our produce during the summer months. I am pretty sure that Simpson Family Farm is still enlisting for the chicken CSA….these chickens eat grass and bugs, might be smaller, probably due to lack of steroids, but they are delicious! If you can’t afford a CSA, some can be costly upfront, maybe recruit some friends or neighbors that might share the cost with you and the enjoyment of the delicious food to come. Farmer’s Markets are another great way to get local produce and meats without the cost of the CSA. I have also added a link to the farmer’s markets in Indianapolis in my local links. Hope to see you there, without car, of course! Happy Earth Eternity! So a few of the roller derby girls are doing a Paleo diet and they were talking about Paleo Brownies that they made. We all agreed that if you are going to have brownies, just have the real thing….with real flour, sugar, oil, cocoa, etc….its not as if we eat brownies everyday. Then I got to thinking, paleo brownies? Really? Is this just a way for those to say they are on a strict “Paleo diet” and still have dessert? For those of you unfamiliar with the Paleo diet, it is in accordance with how our ancestors used to eat in the Paleolithic era, also known as the Stone Age, which was in the age between 20,000 to 2.5 million years ago. The diet consists of most of what I promote here: fresh fruits and vegetables, nuts and seeds, and natural meats. It does not include processed foods, for obvious reasons, nor potatoes, beans, or dairy. It is an extremely simplistic diet and one that I would promote, but I also think that other foods can be included for those of us that want a little more variety and as modern equiment has made other items available like dairy. I am pretty sure that our Paleo ancestors did not make brownies, nor did the have the means to do so. They for one, did not have ovens that heated to exactly 350 degrees, and probably did not have access to cocoa or spend their time grinding almonds and other nuts into flour. Paleo brownies are the equivalent of someone saying that they are going to make a solid wood table and then it is some crappy particle wood….yes, its wood, but its certainly not the same. I don’t have a problem with these brownies in particular, but they aren’t Paleo. I am not sure if some that do this are searching for a way to have dessert, to make dessert healthier, or just trying to be elitist in their food options, which many people do, but it is definitely not the roller girls I know. Brownies and other dessert, can be included in a healthy diet, but if you are eating them so much that you feel the need to make them “healthier,” then you may want to reconsider how often you have dessert. Some people that have a gluten intolerance, certainly couldn’t have regular brownies, so these brownies that have no wheat flour, would be a good option. Bottom line, if you want to eat a brownie or another dessert, eat it. If you want to make it healthier, then do so by using almond flour and better ingredients, but don’t glamorize them into a Paleo diet….it just makes me roll my eyes. Eat food. Not too much. Mostly Plants. As spring hits, my miles starts to amp up as does my love of running. 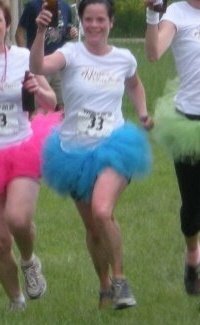 The picture to the left is of last year’s Dances with Dirt relay….and, yes, we wore the tutus the entire race! We were crossing the finish line, with beers in hand, after 60 miles out in the mud, bushes, ravines, hills, and tunnels. I have NEVER been so sore in all my years of running or other sports, for that matter. Our team, the eXXtreme dirty dancers, will ride again on May 15 in Gnaw Bone, IN. Then, after this, I start marathon training. I will be embarking on my 6th full marathon this fall, training starts at the end of May. 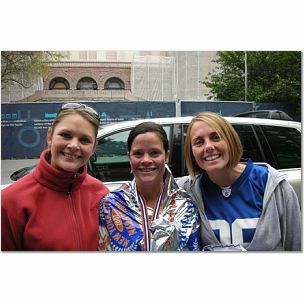 My first marathon was Chicago in 2006 with a finish time of 3:38:40. I was on my way to Boston, which was a fantastic experience, although I swore off running full marathons after the hilly and Nor’easter experience that was the 2007 Boston Marathon. But, I had somehow blocked out the pain that fall as I began training for the New York City marathon. NYC was my favorite, maybe it had something to do with my entourage, but it is awesome experience to run through Central Park as thousands of screaming spectators cheer you on for those last grueling miles towards an amazing finish. This picture is with a few of my entourage, Kimmy and Gordo! Last year I revisited Chicago to get my personal best time of 3:29:30; my goal was 3:30:00. The weather was absolutely perfect and my hard training paid off. Immediately after the race, I started thinking about my next marathon. Other runners understand this crazy obsession, but many stand open-jawed as I tell them that I am going to run, yet another, 26.2 mile marathon and put in about three 20+ mile runs during training. For me, running provides some clarity to an otherwise busy and sometimes stressful day. Nothing gives me more peace than hearing that repetitive foot strike on pavement. Marathons give me something to work toward. Training for 18 weeks provides me with the structure to reach those goals. I like goals! And so, again, I embark on my next goal…The Berlin Marathon….and since finishing is just not enough for me, my time goal is 3:25:00. My husband will be running his first marathon with Berlin, we’ll see if he catches the running bug. You may ask how I finally convinced him to run…with beer, of course. Well, it was actually all his idea, although beer may have had something to do with it. 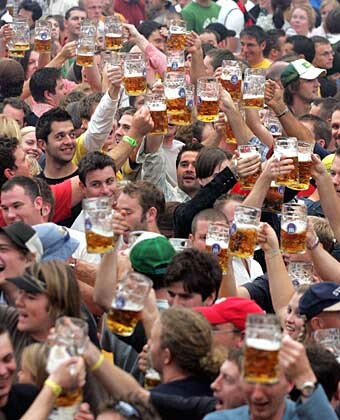 After the marathon, we are heading down to Oktoberfest in Munich. Good German beer shall be our reward. Prost!